Heavenly Father, you are wonderful and generous beyond description. You have shown your love by sending your Son to be my Shepherd. Help us hear his voice through your Word. Help us hear his voice through the wise counsel of spiritual friends. Help us hear his voice through the words sung to be by our brothers and sisters when we are assembled. Help us hear his voice in the Holy Spirit's work on our conscience. 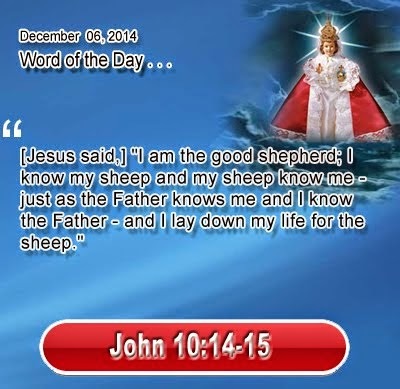 Holy Father, we want to follow your Son as our Shepherd and Lord because we know he, like you, is good! In the name of our Shepherd and Lord we pray. Amen.